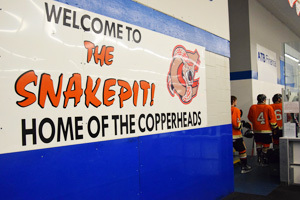 Coaldale Copperheads this past weekend experienced their first away league games of the season. In out of town affairs the Snakes were guest to home openers in Medicine Hat and Blackfalds stealing four points for the weekend. Saturday night the Copperheads had a strong opening period against the Cubs. The Snakes scored three goals on eight shots with the first coming from Tyler Anderson in the first minute of game. Christian Dees secures the second goal from teammate Anderson’s pass. Rookie Jason Creighton then netted his first career goal in his first league game. He also sent out many noticeable body checks to the opposition in his first debut. End of the first period the Copperheads took a commanding 3-0 lead. The second period was scoreless for either team. A lone goal in the third coming from Dees one more time ended on a 4-0 victory over the Cubs. Sunday the Copperheads bright and early headed north to Blackfalds to tackle the Wranglers in their home opener. It was Jason Creighton earning the first goal of the game. Christian Dees having a good weekend as well, scores on a slight breakaway the Snakes second. Blackfalds scores one on a power play near the end of the first period and then ties the game early in the second period. Brant Mack new to the Copperheads roster this season, obtains his first HJHL goal shortly after Wranglers getting momentum. Ty Anderson with a hot potato type goal pulled the Snakes ahead 4-2. Blackfalds with a strong third period ties the game once again sending it to overtime. No goals were scored in the five minute extra time leading to a shoot out. Christian Dees and Ty Anderson both scored the two shoot out goals and Broc Merkl made the final big save in net for the Snakes to earn the road win. This puts the Copperheads at 3-1 in league play for the season to date. Upcoming weekend, will be the annual three game Thanksgiving home stand for the Copperheads. Saturday the 6th Medicine Hat game is at 8:30; Sunday Cochrane General will play the Snakes at 5:30; finishing off the weekend Monday the 8th against the newest HJHL team the Lomond Lakers at 2:30 p.m.
A very important reminder for all three games the Copperheads are asking fans to help give to others in need by bringing a non-perishable item for the Coaldale Food Bank.